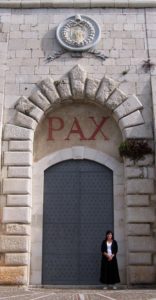 Pax is the Latin word for peace. Pax Romana was originally used to describe the long period of relative peacefulness under Roman rule before the 3rd century. Saint Benedict took the word and adopted it as the motto of the Benedictine order he established. Peace is the essence of the Benedictine Way of life. I selected PAX as the identity of my website, because I have been living under the tenets of Benedictine Spirituality for 15 years. During that time, I have discovered the irresistible nature of peace. Peace is the answer. Not the peace that is the mere absence of strife, although that is nice, but inner peace, the peace of Shalom. The peace that comes from knowing that no matter what happens while I live, I will not be overcome. With this website, I want to share the lessons I’ve learned, and the tools I’ve found. Peace IS attainable, every day, but finding peace isn’t a passive thing. Finding peace requires two things, you must pursue it daily, and you must cultivate a space for it inside you. PAX is a way of life. If you’re interested in learning more, I’ve make a few book recommendations here. That’s me, in front of the ancient door way to Saint Benedict’s Abbey at Montecassino, Italy. Saint Benedict was a 5th century Roman citizen. Like all young men of his social class, he traveled to Rome for his formal education. Once in Rome he was appalled by the corruption in the great city, and in the church. Discussed and disillusioned he escaped to the city of Subiaco, a remote hill town about 40 miles east of Rome. There he lived the life of a hermit for 3 years. His story has several twists and turns at this point, and there are few writings of his life. What endures is his Rule for community life. His Rule formalized western monasticism and changed the course of history. I know, you’ve never heard about this … but, it’s true. It was the monasteries that kept began the tedious task of copying Scripture. It was the monasteries that valued education and established the first university-ish system. It was the monasteries who first practiced the healing arts of medicine. It was the monasteries who … well, I could go on. Don’t believe me, Google it. Do you need a PAX check-in? Here’s a Spiritual Exercise I’ve put together, it will help you on your journey to finding peace – today. We all have questions about finding peace … what’s yours? If you'd like me to answer you personally, I'll need your email address.